Thermal insulation includes all of the materials and techniques used to limit heat transfer between a cold area and a warm area. It is used in textiles, automotive, industry and, of course, building, primarily to maintain a comfortable temperature inside rooms. A building’s insulation mus be designed as a whole, with particular attention being paid to thermal bridges. Even when highly efective products are used, the existence of less- or unprotected areas in the building’s thermal envelope can lead to the creation of thermal bridges, causing signifcant heat loss, areas of high humidity and, thus, increased primary energy consumption. For this reason, it is important to create an envelope of continuous thermal insulation around a building’s components. The reduction of primary energy consumption and maintenance costs. The reduction of greenhouse gases produced by fossil fuel combustion and, as a result, a decreased impact on global warming and climate change. The elimination of thermal bridges and, therefore, less risk of condensation. The reduction of random heat losses and rises, which has a significant impact on the comfort and stability of the indoor environment year-round. The heat passing through a wall is measured by heat transfer coefficient U, which is expressed as a quantity of energy in Watts per metre squared for each degree of difference between the interior and exterior of a building (W/m².K). This coefficient U depends on the thermal resistance R (in m².K/W) of each layer of the wall, as well as its overall configuration, which can cause thermal bridges (beams or posts with different insulation levels, pipes passing through the wall, etc.). The thermal regulations are intended to encourage those involved in the building process to design buildings that consume as little primary energy as possible, with the aim of reducing greenhouse gas consumption and contributing to French energy independence. These aims namely arise from Article 4 of the “Grenelle 1” law (2007). 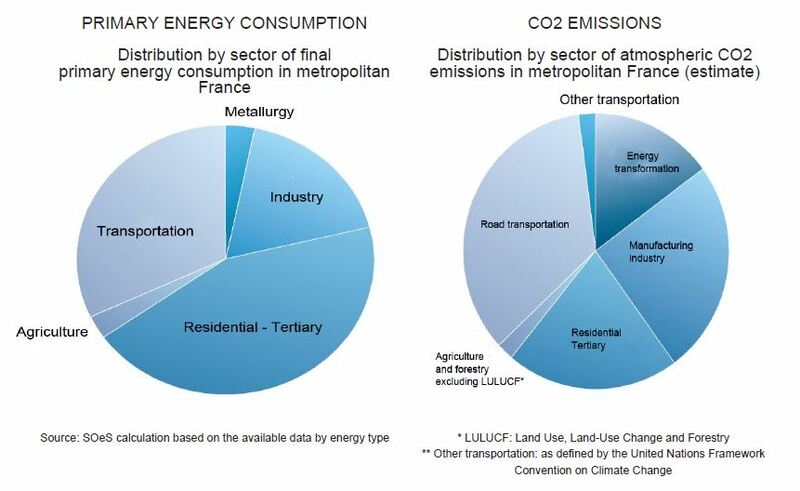 With regard to RT 2012 more specifically, the key aim is to require primary energy consumption of less than 50 kWh/m²/year in buildings on average. The additional setting of an ambitious threshold for buildings’ maximum heating energy requirements in order to ensure the quality of the construction’s energy system design. More concretely, RT 2012 imposes three quantitative results based on these four aims. This requirement involves limiting the energy needed for heating, cooling and lighting of the building; this requires buildings to be designed with good thermal insulation. The “Bbiomax” criterion is defined according to the geographical area, the altitude and the surface area of the building in question. The “Cmax” coefficient requires that the building’s primary energy consumption be limited. Five criteria are taken into account in calculating the coefficient: heating, hot water production, cooling, lighting and the auxiliary systems (fans, pumps). 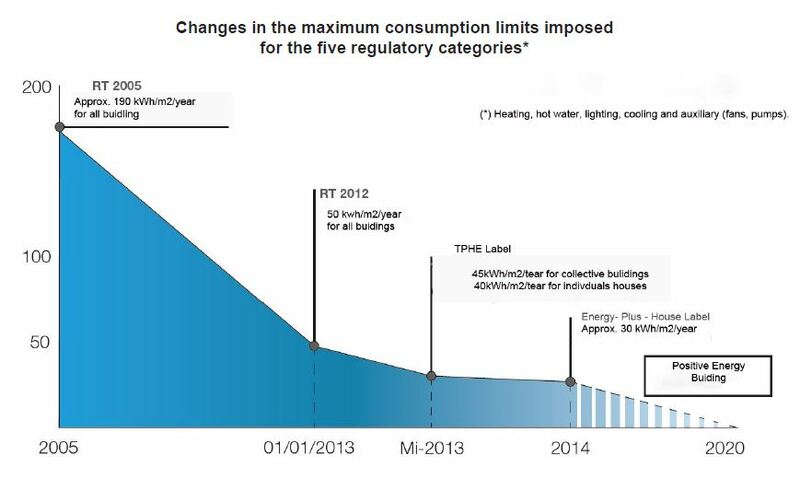 On average, the consumption limit imposed is of 50 kWh/m²/year. This limit can be adjusted depending on the building type (individual, collective, tertiary, etc.) and the geographical area in which it is located. After five days of heat exposure, the building’s interior temperature must not exceed a certain level. This criteria is called Tic (conventional indoor temperature). RT 2012 recommends that thermal bridges and airtightness be tightly controlled (the “blower door” test, for the latter, is now mandatory for collective buildings). These two criteria ensure the quality of the system’s design and significantly reduce primary energy consumption. The thermal regulations (RT 2005, and now RT 2012) set maximum values for thermal bridges in new buildings.